Watching old podcasts. Nostalgia overload. When it comes to my comeback, I'm just getting started! The holy trinity of television = 24, Twin Peaks, Lost. 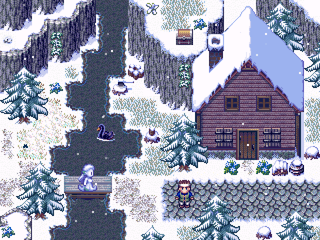 Where would your life be without RPG Maker? Replaying Carlsev Saga for the first time in many years...oh my god. It's really hard to play through your old games, especially when they're noob games. Ugh I've had a sore throat for like a week now. One side of my throat. One spot. So annoying. Hope you SMBX fans enjoy my guest level in Mario's Mansion 4 - it's quite musical! Feels GREAT to have another completed game under my belt, no matter how short.